Home/Blog / Are Lasers an Effective Treatment Option for Hypertrophic Scars? Scars are the result of an injury to the skin, either traumatic in nature such as one caused by an accident or elective like one that is a consequence of surgery. Usually they heal level or nearly level with the surrounding skin though they can be wide. When they heal in a considerably elevated fashion within the area of the injury and are associated with firmness and redness, they are called hypertrophic scars. 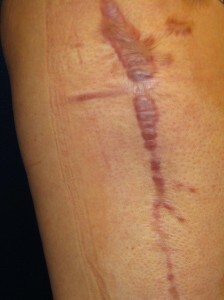 These types of scars usually develop soon after the injury and may regress over time, sometimes a year or more. Often, they are associated with pain and burning. Though they are frequently confused with keloids, the distinguishing factors are that keloids usually appear months to even years after the injury and extend considerably outside the original scar. Some of the common treatments for hypertrophic scars include surgical excision, steroid injections, topical silicone sheets and cryotherapy (cold therapy). A variety of lasers have been also been used in attempts to treat these scars. Because lasers are high tech and have been touted for a multitude of other things, many patients request to have their hypertrophic scars treated using a laser. Can lasers be employed to effectively and predictably treat hypertrophic scars or is their usage just hype and marketing? A review of the literature on the usage of lasers in the treatment of hypertrophic scars was conducted and published in the November 2011 issue of The British Journal of Dermatology. It analyzed the data only from non-biased and properly controlled previously published clinical trials that employed a variety of lasers. This amounted to thirteen articles reporting on seven different laser types. They found that only one of the seven laser types showed any evidence of possible therapeutic benefits. This was a pulsed dye laser (PDL) at the 595 nanometer wave length. In their conclusion, they stated that there was insufficient evidence at present to be able to recommend any laser as an effective treatment for hypertrophic scars though future studies may cause this approach to change. So there is your answer! If you would like more information on the treatment of hypertrophic scars, keloids or on any other plastic surgery procedure that I perform or to schedule a consultation with me, please call my office at 480-451-3000.